The ultimate in high-power; deliver superior sound from your amplifier or receiver to your speakers. • Oxygen-free copper ensures maximum fidelity. • Ideal for home theater and music applications. Read how we got 4-3/4 out of 5 stars from Audioholics. SonicWave™ Speaker Interconnects by Impact Acoustics are the perfect combination of transparent and neutral, high quality audio reproduction and beauty. 10 AWG oxygen-free copper is constructed from 7 bundles of 18 AWG conductors for maximum flexibility. A 12mm PVC jacket provides the protection your cables need for a lifetime of performance. Two interchangeable connector options easily attach to the cables and provide configurations for the most common high-end speaker applications. 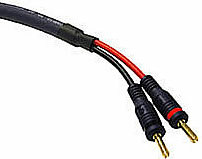 Every speaker placement requirement is unique, so these cables are sold individually to make it easier to buy the cable lengths required for your specific installation. Recommended by Audioholics.com for the Mid-Priced $5K Budget Home Theater System. 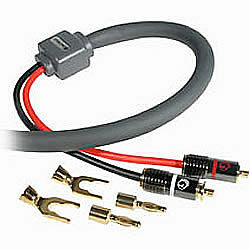 Velocity™ speaker cables offer superb performance in any installation. These 12-gauge oxygen-free pure copper stranded cables are designed to minimize capacitance and inductance, leaving you with clean sound that is true to the source. Terminated with 24K gold-plated banana connectors, Velocity speaker cables deliver a rock-solid connection that provides fidelity and performance far in excess of its price. Get more than you bargained for; get REAL value and REAL performance with Impact Acoustics Velocity™ speaker cables!